1953-54 Parkhurst Hockey saw an increase in the physical size the cards but a smaller checklist. The pictures show better quality, more information, including bilingual text, were added to the backs. However, the design was the same as some of the cards from the previous year, which may be confusing to newer collectors. 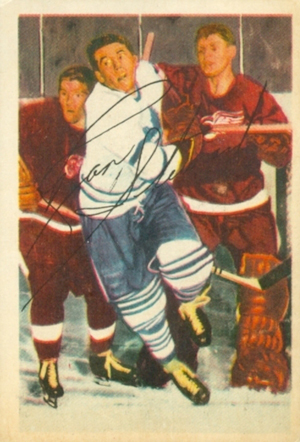 1953-54 Parkhurst Hockey card fronts show a game-action player picture along with a facsimile autograph. The only other feature is the white border that surrounds the card. Backs are vertically oriented. A card number appears in the upper left, with the player's name, team and position running along the top, followed by his statistics from the previous season. The rest of the card is essentially divided into two parts. The first part leads off with vital stats and then gives a short biography of the player. A black box then details a send-in offer for an album that holds the complete set. The second part is a French translation of the first, including the offer in the black box. There are 100 cards in the set, which are subdivided by team. One card features two players (Maurice Richard and Elmer Lach) that appear on their own cards elsewhere in the set, with their last names rendered in block letters. Cards are 2 1/2" by 3 5/8". While their similarity in design to some cards for the previous year can be a problem, the larger size and different back design make them easily distinguishable. Notable rookies in the 1953-54 Parkhurst Hockey include Jean Beliveau, Gump Worsley, Al Arbour, Andy Bathgate and Harry Howell. 1953-54 Parkhurst ALEX DELVECHCHIO #47 KSA 5 EX Detroit Red Wings ! !